US House of Representatives unanimously passes resolution recognizing 50th anniverary of the 1956 Hungarian Revolution. AHF thanks all those who contacted their Congressmen for co-sponsorship! 12/7/2005 - By a unanimous and recorded vote, the House of Representatives passed H. Res. 479 on December 6, 2005. 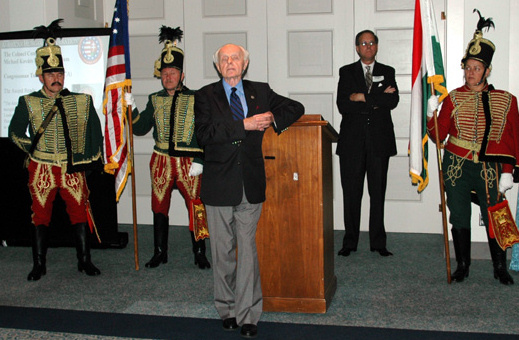 The resolution, which had been introduced by Congressman Tom Lantos (D-CA), recognizes the 50th anniversary of the 1956 Hungarian Revolution and enjoyed the support of the American Hungarian community and its various organizations. (4) reaffirms the friendship and cooperative relations between the governments of Hungary and the United States and between the Hungarian and American people. Passed the House of Representatives December 6, 2005. [read more] about AHF plans for 1956 Commemoration! The American Hungarian Federation is sponsoring the 1956 Portal as part of its goals to coordinate and assist member organizations across the country. The 1956 Portal serves as a central information resource for 1956 activities as our community prepares for the 50th Anniversary of the Hungarian Revolution. The Portal also includes Audio and Video files! If you have additional photos or have plans you would like to promote, contact us! Note: You will need the free RealAudio Player to see the videos. Click [here] to download.